I met them last year at the Rush Craft Fair, a nice gathering of local artisans selling homemade goods: from food to DIY objects. They were on Agatha’s LoveFud stand beside all her beautiful dehydrated fruits…actually, now that I think of that, Agatha was also munching some of them. She had sprinkled some chilli flakes on them. I bought the last bag. I am talking about kale chips! They were surprisingly good, they could easily replace the beloved hand cooked crisp that I wasn’t buying anymore since the beginning of our new diet! The Hubby was more pleased than I was. He started searching the internet wanting to buy a dehydrator, making excel tabs to compare prices and trying to persuade me as well of the purchase. We are both very tempted but at the moment lack of space and fear of noise are stopping us from buying one. In the meantime, almost by chance, I found out a way to make kale chips myself in my oven. It was Friday and as every Friday I was baking pizza. I usually bake 4 or 5 pizzas with different toppings. Not using meat anymore, I often find myself experimenting new options regarding what to put on top of my pizzas, also depending of what I have in the fridge. That Friday I tossed a few kale leaves on top of passata and mozzarella. Personally I didn’t like the kale on that pizza, also because it was burned and therefor bitter, due to the high temperature needed to bake the pizza. But the kale was crunchy and made me start to experiment in order to achieve good kale crisps. Sometimes I put too many leaves overlapping each other in the tin and that didn’t help to achieve crunchiness. Some batches went to the bin because they got burned. But now I am satisfied! 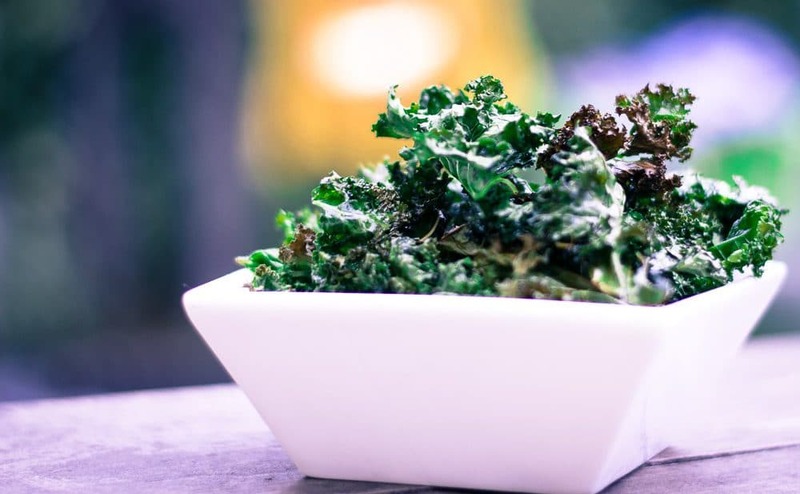 The oven baked kale crisps will crumble into your mouth making that adorable crunchy sound! Note: once you have coated the kale leaves with extra virgin olive oil you can sprinkle spices or seeds on top as they will easily stick to the oil. Strip the leaves from the stalk. Place the torn leaves in a salad spinner and make sure they fully dry. Take a big metal oven tray and place the leaves on it. Be careful not to overlap them. Pour some olive oil on top of your kale. Move the leaves with your hands so that each of them is coated in oil. They shouldn’t be floating in oil, only be coated. Place in a preheated oven at 130*C for 20 mins.